This weekend we got around to hanging a few things in the powder room- 2 white shelves from Target and a mirror from Lowe’s. The lighting is impossible in this room and yes there is spackle all over the walls. One of the shelves took a plummet in the hanging process and took some wall with it. The story of our lives. We’re thinking of spraying the shelves a glossy white, using the remaining spray paint from the deer bookends I recently sprayed. I just like the idea of blending them with with the sink and potty. We knew we wanted something fancy looking. 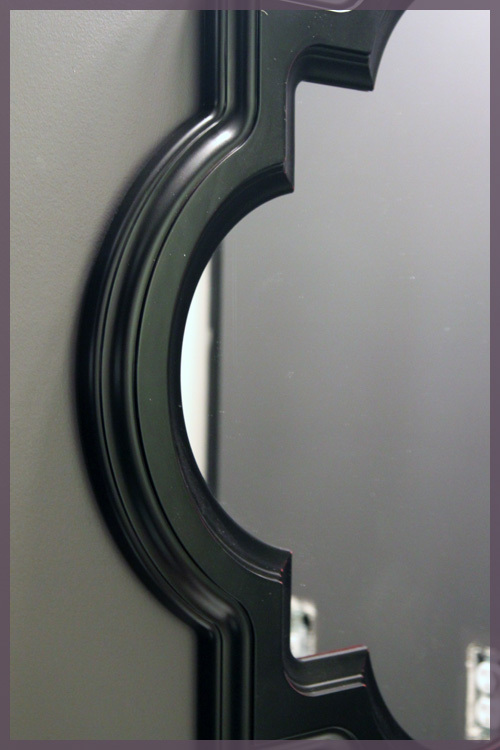 I’ve loved this mirror for as long as I can remember and previously considered putting it in the entryway. But this espresso finish? Not staying. Yes, we’re planning on painting this frame an aqua sort of color, as I mentioned my love for this combo last week. 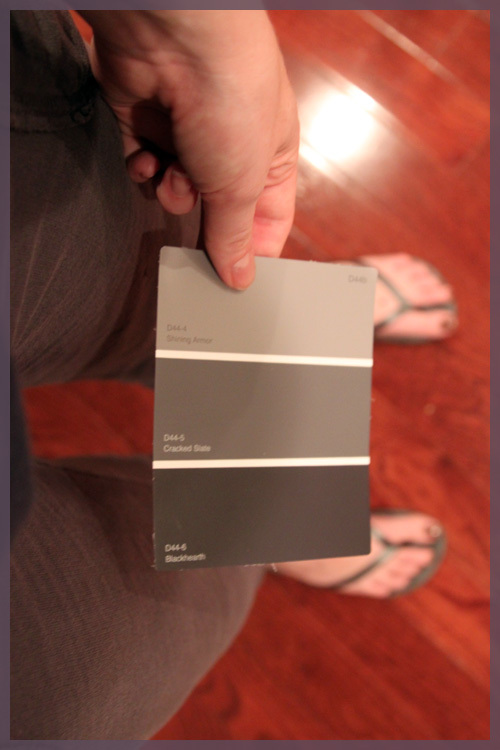 I’m thinking we’ll go with one of the lighter tones to balance the super dark walls. It’s come a long way from where it was just 2 weeks ago! Our main goals at this point are to paint the shelves, paint the mirror and finish all of the touch up work that we keep piling on. Then I’ll figure out what to put on those shelves! 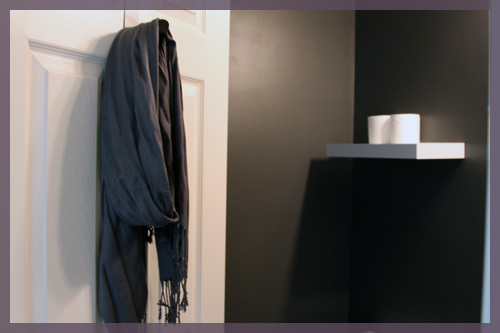 You already know that we unexpectedly painted our powder room a bold charcoal gray. I knew I wanted some bright white floating shelves, so we picked up some inexpensive ones from Target and we’re currently in the midst of hanging them. 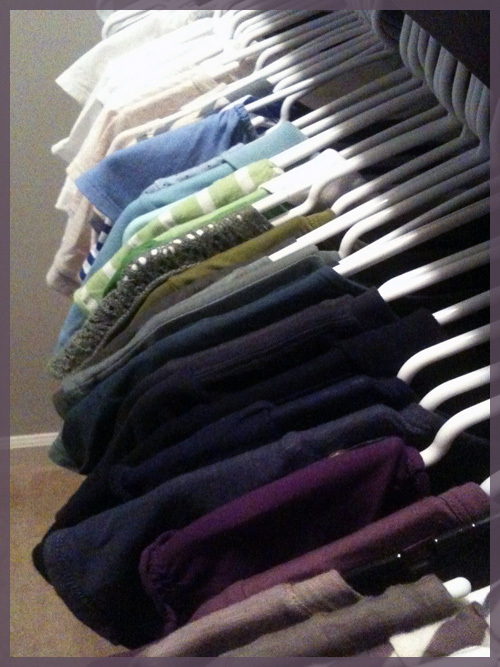 Since the gray was a complete compulsive move, I didn’t have much else planned. The room is dark and needs pops of white (which we plan to add more of with the shelves, frames and some crown molding), but I also feel like it needs a fun accent color. My initial instinct was to go yellow. Gray and yellow are about as hot as brown and blue were 5 years ago. Don’t get me wrong, I like the combo and I’m planning to add some yellow to our living/dining rooms, but it seemed a little not me. I’m just not a warm color person and for the amount of bold I want in this bathroom, it would be a little too much yellow for me. Maybe elsewhere yellow, maybe elsewhere. As well as a pair of cargo pants and numerous shirts. 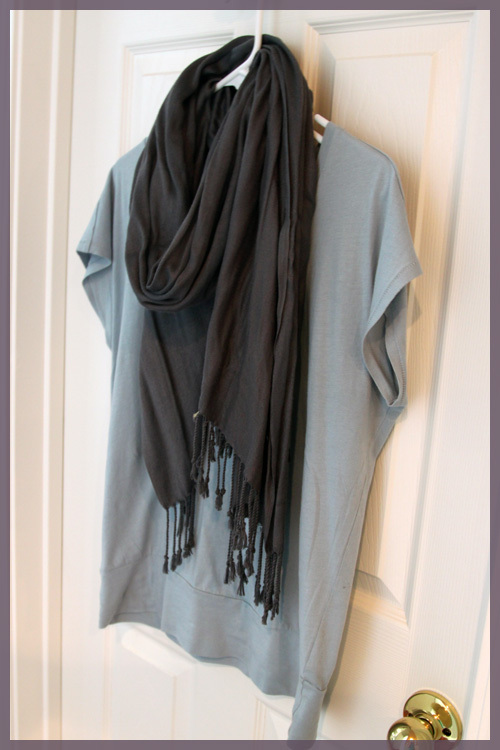 I then remembered this outfit I have pinned on Pinterest and have always loved for the aqua scarf and gray tank. 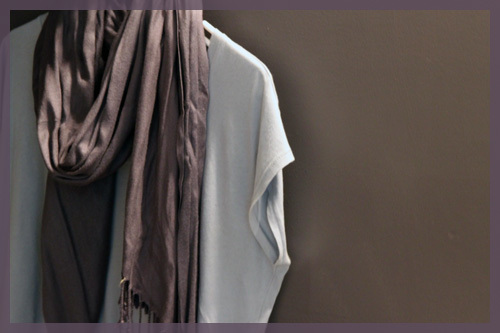 So I went for a pale blue shirt to go with my gray scarf. Then a little light went off in my head. 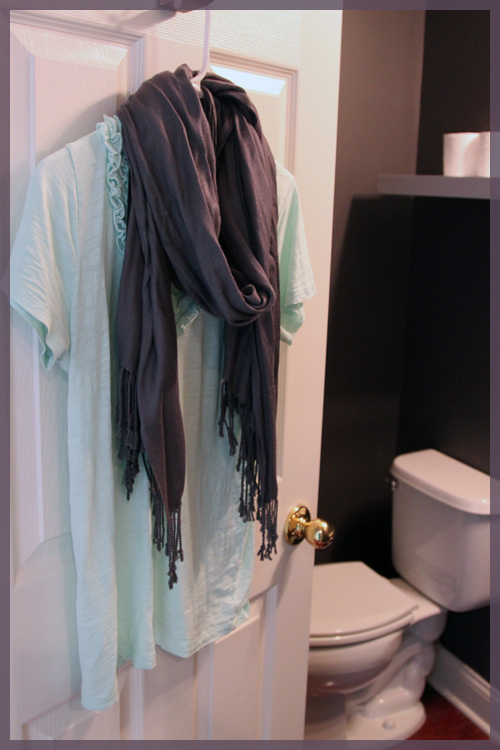 Why don’t I use my Pinterest outfit to inspire my bathroom? 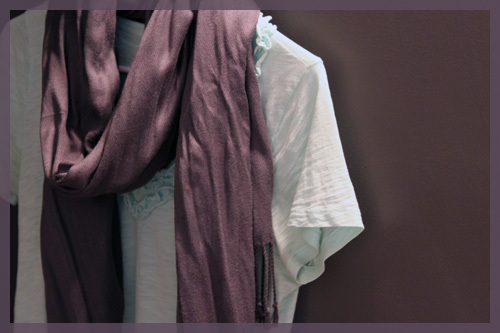 I love the aqua and gray and I even love my take of the light blue and gray, though this other shirt I have is probably more accurate to the Pinterest scarf. It has more of a minty green tone to it compared to the light blue shirt, though it’s subtle. ps- I inititally planned to photograph myself in all of these outfits while standing in the bathroom for some comedic effect, but the thought of changing all of those times before it gets dark out in 20 minutes was just draining. 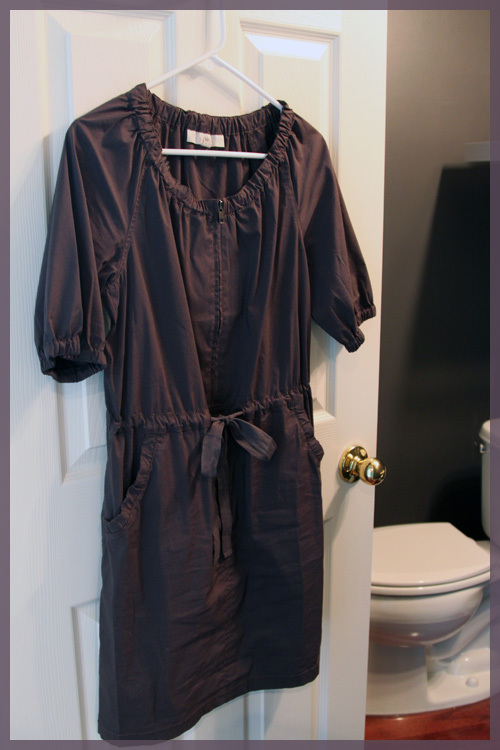 If anyone else would like to stand in their bathroom, in outfits that match their walls, please do so for my entertainment 🙂 And if you’ve ever decided on a color palette while standing in your closet, please share that too! 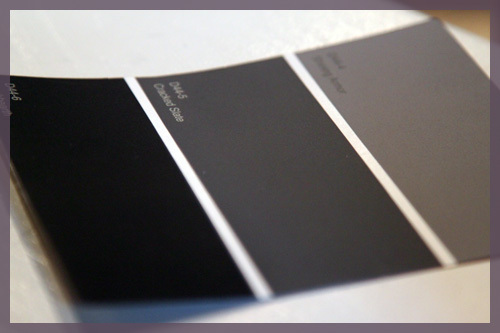 Paint It Black, errr, Dark Gray? 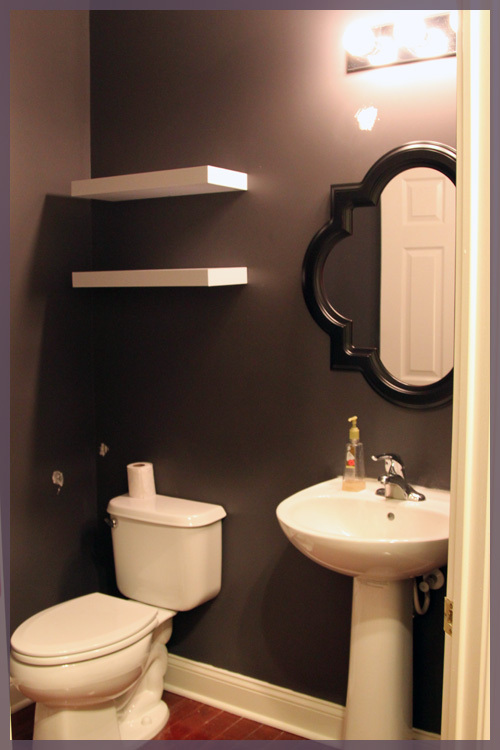 Before I even dive into this post, do you guys know how hard it is to take pictures of an awkward sized powder room? 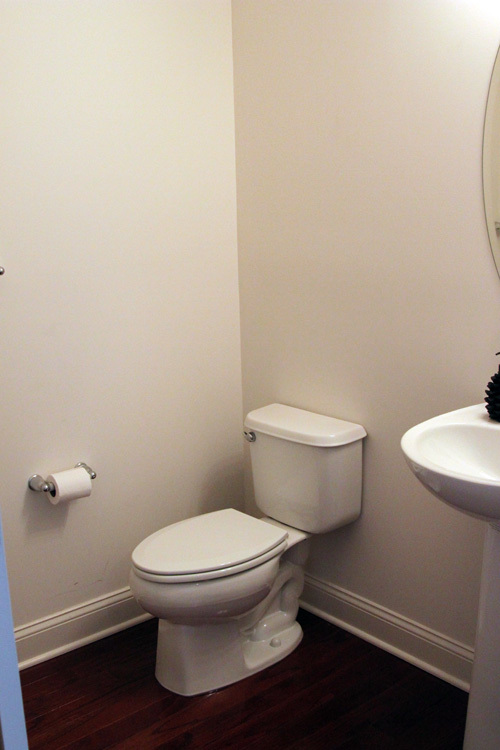 An awkward sized powder room that is a bit sandwiched in the hallway between the front door and the kitchen? I had NO idea how to properly capture this space, so you’re only getting two pictures tonight! 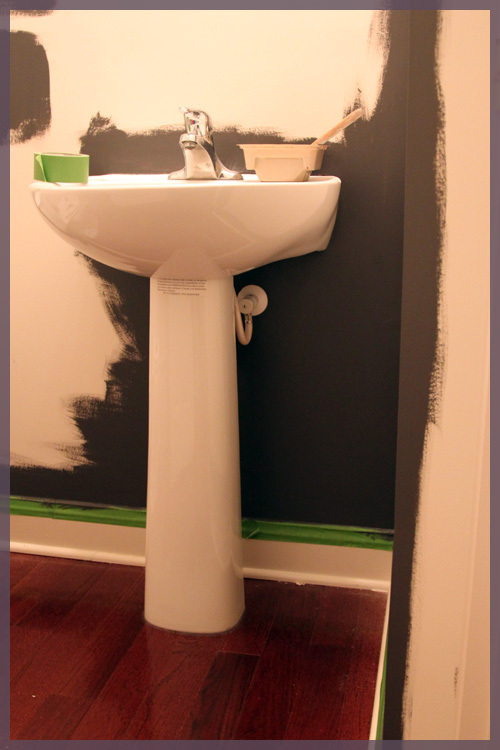 The powder room is pretty much entirely painted. 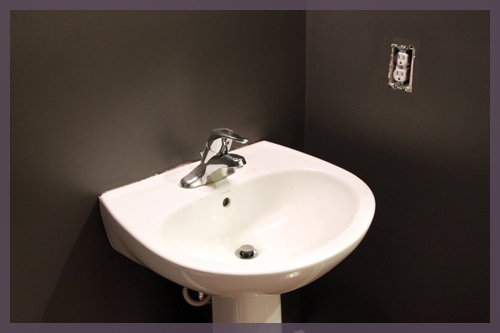 We do have some touch-up work to do as well as some re-caulking in some areas. But otherwise, the incredibly dark and dramatic paint is here to stay. The pictures don’t really do it justice, the contrast just isn’t strong enough. I’m sure once we fill the space with some accessories, the space will look incredible. The dark gray really is growing on me though! Especially after spending a few minutes in there glazing at a wall. TMI? Too far? We’re friends, right? 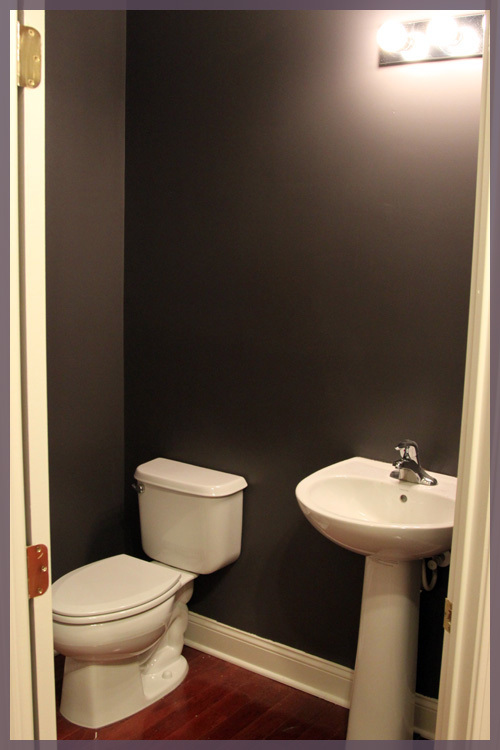 Here is the powder room from the hallway. Holy dark Batman! It does look a bit black, but I swear, it’s not. And here is from another angle. I was hoping to capture the color better against the glossy white sink. Did it work? 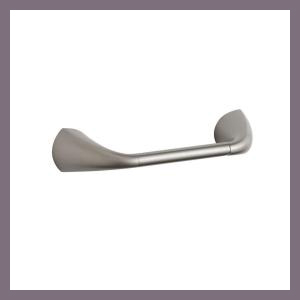 While spending some time in Home Depot yesterday picking up supplies, we decided to look at towel racks and the like. We found a set we liked, but for the price (roughly $25 for the towel bar and another $25 for the toilet paper holder) we just weren’t completely sold. 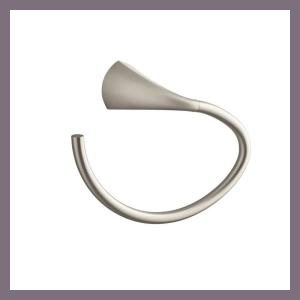 We both loved this towel ring as it’s entirely seamless, but after sleeping on it, I think it screams “THIS IS US!” too much. 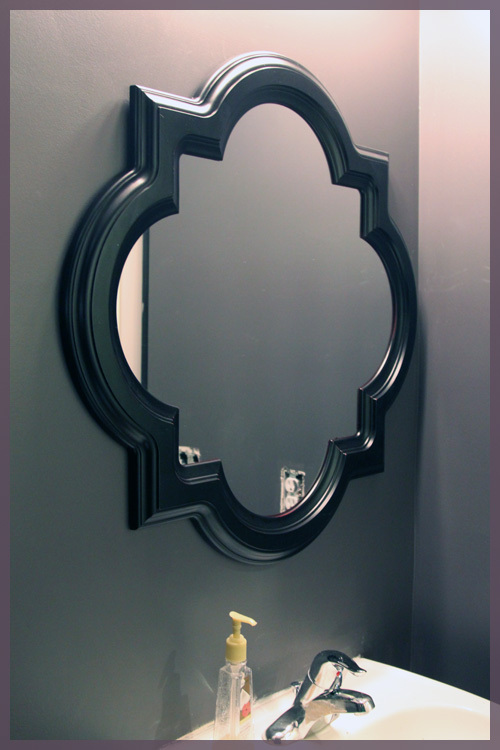 Do we really want something that screams “US!” in such a dramatic powder room? I think we can be a bit more creative in this space than going with something predictable. But ten bucks says we still settle on it. And here is the toiler paper holder. 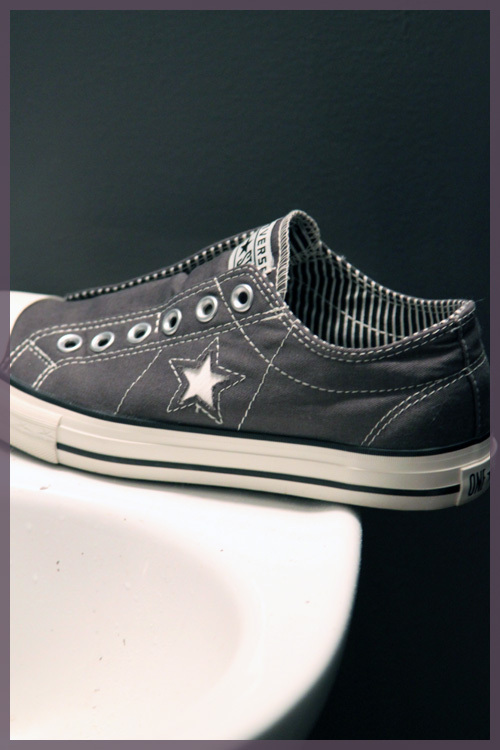 Again, we love the brushed nickel and the seamless design — but I feel like we’ve done this before. What do you think? Do we go with the predictable options? Or do we set out to discover something a bit more creative? My hesitation with the latter is, how creative can you really get with these things anyways? And by the way, this was the first time I have painted where 1) I didn’t get paint all over my clothes and 2) I didn’t get paint in my hair! And Macky stayed paint-free as well! Remember that project I mentioned last week? Yeah well, I didn’t work on it at all this weekend. Mostly because it’s labor intensive and not a Mike job, so it’s a lonely one. With a spare day in this weekend, I woke up and decided to tackle an entirely different project, yay! Because really, what is this blog if it’s not full of unfinished projects and decorating A.D.H.D.? With a little twisting of the arm, I talked Mike into painting today. He HATES painting. Did I ever tell you that we started our chair rail project because Mike didn’t want to paint the powder room? 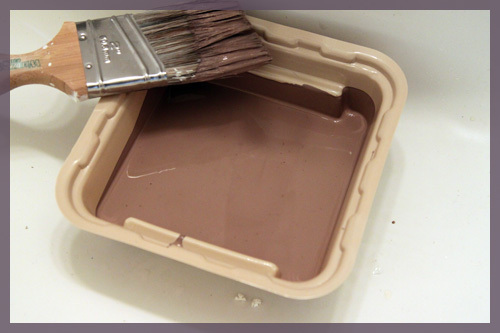 Yes, he would rather start a major molding project than paint a very small room. Well today, his time was up. The powder room it was! 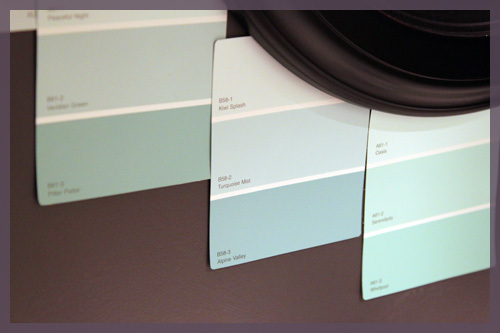 We had a spare can of Benjamin Moore Smoked Oyster that was color matched to Olympic’s no VOC paint. We originally bought it to paint our office stripes but our lighter stripe ended up being darker than we wanted so we made that our dark stripe and picked a new light stripe, sidelining the Smoked Oyster. 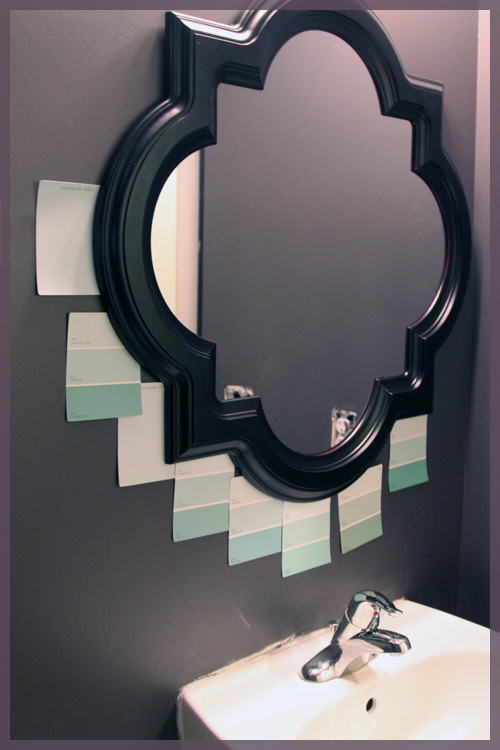 The Smoked Oyster was actually the color of our spare bathroom in our condo and I always loved it. 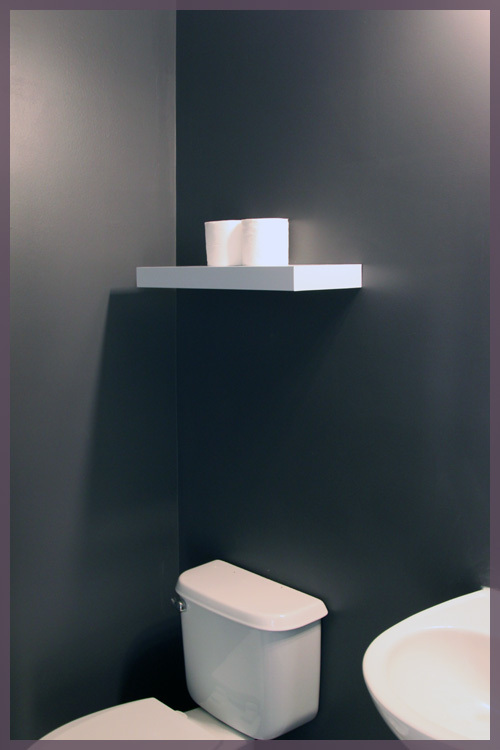 I’ve been itching to incorporate it into this house and I figured the small powder room was the best choice. First, I guess I should introduce you to the powder room? It’s not much (and very hard to take pictures of), but it’s a decent size for a powder room. My major pet peeve with this room is that the towel bar is to the left of the toilet paper holder in this picture. So you wash your hands at the sink, then have to run across the room for a towel? No bueno. 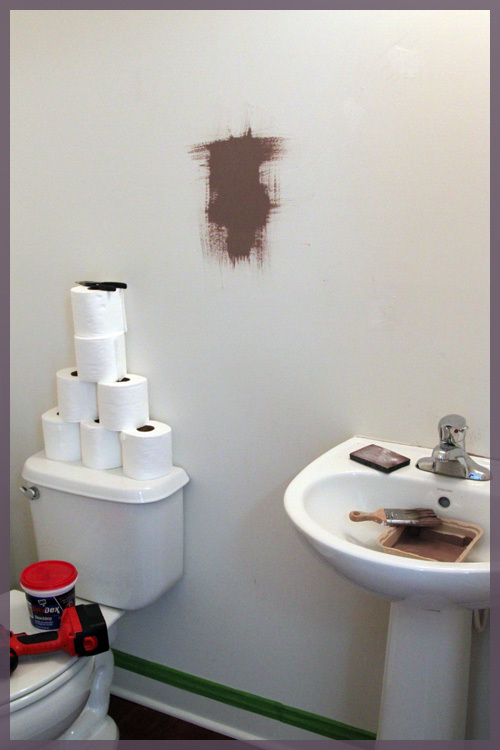 We knew that towel bar was coming down, so we removed it (along with the toilet paper holder, to paint. I wanted a quick and easy day project, so we didn’t plan to replace anything else at this point…just get some color on the walls and do the rest gradually. We were going to remove the mirror because we were planning to replace it eventually and we didn’t want to paint around it, but upon unscrewing… it broke. 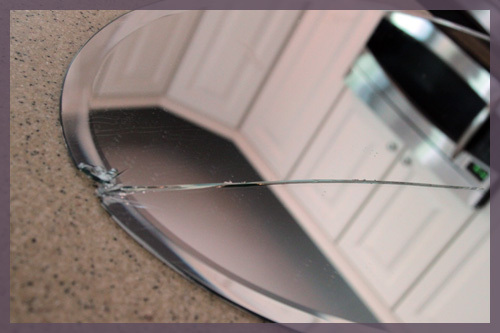 Seven years of bad luck…or less time with an awkward, oval shaped mirror. No biggie, it’s not like we get dressed in there in the morning. Then something else happened, I put the Smoked Oyster on the wall and… it was fugly. It’s the color in the middle- Cracked Slate. I know, some of you just fell over. I painted a small room with no windows nearly black? Yes, yes I did. And it’s not black, it’s very hard to capture on camera. It’s a satiny navy blue-ish, deep purple-ish, very inky color. I normally never tape and just free hand it, but I thought a dark color was risky. Turns out taping made more of a mess and we have a lot of touch ups to do. Somehow our to-do list has grown to include crown molding, since a dark wall meets white ceiling is near impossible to do flawlessly. ps- I start grad school again tomorrow and I have class on Tuesday nights until 10:30… which means I won’t be home until 11:30. I will do my best to get you some after pictures tomorrow!